The Monk Paisias the Great lived in Egypt. His parents, Christians, distributed generous alms to all the needy. After the death of her husband his mother, on the suggestion of an Angel, gave over her young son Paisias to clergy of the church. The youth Paisias loved monastic life and spent his time in one of the Egyptian sketes. Disavowing his own will, he lived under the spiritual guidance of Saint Pambos (Comm. 18 July), finishing all the tasks assigned him. The starets/elder said, that a newly-begun monk in particular needs to preserve his sight, so as to guard his senses from temptation, and Paisias, heeding the instruction, went for three years with his eyes cast downwards. The saintly ascetic diligently read spiritual books and he was especially notable for ascetic fasting and prayer. At first he did not taste of food during the course of a week, then – of two, and sometimes after partaking of the Holy Mysteries of Christ, he remained without food for seventy days. In search of solitary quiet the Monk Paisias went into the Nitreian wilderness, where he lived in a cave carved out by his own hands. There the monk was vouchsafed a wondrous vision – the Lord Jesus Christ revealed to him, that because of his labours all the Nitreian wilderness would become inhabited by ascetics. The monk was impelled to ask the Lord where in the wilderness would the monks obtain the necessities of life? The Lord answered, that if they would fulfill all His commandments, He Himself would obtain for them all the necessities, to put them beyond demonic temptations and cunning. With time there gathered to the Monk Paisias a number of monks and laymen, and thus was established a monastery. The primary covenant of the Monk Paisias was one: no one would do anything by his own will, but in all things would fulfill the will of his mentors. Burdened by the disturbance of the quiet, the monk withdrew to a yet farther cave. One time he was transported to a paradaisical monastery and vouchsafed there to partake of the non-material Divine food. After his ascetic labours for salvation, the Lord granted His saint the gift of foresight and healing the souls of men. In the life of the ascetic is reported an instance when one of his disciples, with the blessing of the monk, set off to sell handicrafts in Egypt and on the way he encountered a Jew, who suggested to the simple-minded monk that Christ the Saviour is not the Messiah, and that another one, a true one, will come. Confused, the monk uttered: "Perhaps it is true what thou sayest", – yet he did not attribute any particular significance to his words. Having returned, he saw with grief that the Monk Paisias would not acknowledge his arrival, and he asked the reason for his anger. The monk said: "My disciple was a Christian, thou art not a Christian, from thee hath departed the grace of Baptism". Having repented, the monk with tears besought to have absolved his sin. Only then did the holy elder rise up to prayer and seek forgiveness of the Lord for the monk. A certain monk on his own initiative left the wilderness and re-settled not far from a city. There he had encounters with a woman, who hated and blasphemed Christ the Saviour. Having fallen under her influence, he not only left monasticism, but also scorned faith in Christ and finally he arrived at total disbelief. One time, through the blessed Providence of God, Nitreian monks came past his home. Seeing them, the sinner remembered his own former life and he asked the monks to convey to the Monk Paisias, that he pray for him to the Lord. Hearing the request, the monk began to pray fervently, and his efficacious prayer was heard. The Lord, appearing to His saint, promised to forgive the sinner. Soon the seduced-monk's woman-companion died, and he returned to the wilderness where, weeping and distressed about his sins, he began to labour at deeds of repentance. 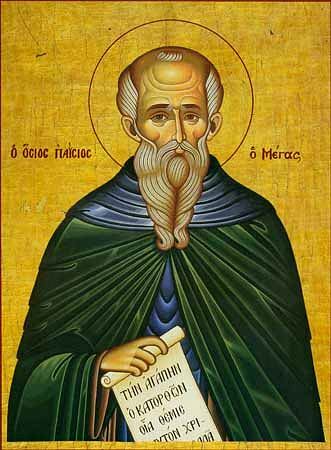 The Monk Paisias distinguished himself by great humility, and accomplished ascetic deeds of fasting and prayer, but as far as possible, he concealed them from those aside. To a question of the monks, which virtue is highest of all, the monk answered: "those, which are done in secret and about which no one knows". The Monk Paisias died in the V Cent. in extreme old age and he was buried with veneration by many of the gathered monks. After some while his relics were transferred by the Monk Isidoros Pelusiotes (Comm. 4 February) to the Pelusiot Monastery and placed alongside the relics of the Monk Paul of the Wilderness, with whom the Monk Paisias in life was in particular spiritually close.